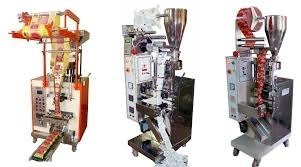 With sincere intentions to preserve and uplift our reputation in the market, we bring forth a distinguished assortment of Flexible Packaging Machine. Our offered machine is manufactured using utmost-grade raw material and cutting-edge technology in compliance with defined quality standards. The offered machine is used for packing applications. Keeping in mind the diverse requirements of our clients, we provide the entire range in various sizes and designs and at affordable prices. We Krishna Overseas International, from 2012, are serving our customers by manufacturing and exporting a high-quality Labeling and Rinsing Machine. Offered products range consists of Bottle Unscrambler, Monoblock Machine, Labeling Machine, Rinsing Machine, Industrial Conveyor, Shrink Tunnel etc. We use high-quality material and latest technology while manufacturing these products. The product range is highly required for their attractive features like dimensional accuracy, high strength, and corrosion resistance, easy to use and longer life. Our offered products are widely demanded in the various packaging industries. For a high production rate, we have developed a highly advanced and well-equipped infrastructure facility. For smooth running of our business, we have divided our facility into various active departments. Our professionals selected through industry approved selection procedures. We are able to deliver all the products on time at client’s destination, as we have developed a wide distribution network. Moreover, we have developed a huge client base across the market.